On today’s episode of Straight Talk, David Lewis talks about what you should offer the customer on the first penciling, the first real step in your negotiation process. Hello again and welcome to another episode of Straight Talk. 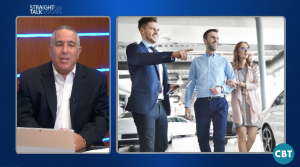 I am your host, David Lewis, and I want to thank you for joining me for these next several minutes while I share with you some of the principles of success I have learned in over 35 years of working and training in the retail automotive industry. The goal of this program is to help you find new and better ways to build a highly successful career in the car business and today I want to speak to you about what to offer the customer in the first penciling of a deal. The first real step in your negotiation process is what most call the First Pencil. If you want the customer to pay cash your first pencil will be a cash number. If you want them to finance the car your first pencil will be a retail term and monthly payment amount and if you want them to lease the car, then your first pencil should be a lease. For me, my first pencil is always a lease. The reason for this is that it usually provides for a lower payment and for the most part provides a better than average chance that they will return to me again at the termination of their lease. Of course, you don’t tell the customer you’re getting a lease payment, you just get one and then present it to the customer. Once you’ve done that and the customer looks at the numbers some will just say, Okay. Others may say, “well we were not planning on leasing” to which you respond “Why not?” And they might tell you they just don’t lease a car they usually buy it. You then explain to them why leasing is the way to go. Leasing gives you a guaranteed return value, for example: let’s say you Lease this car for $30,000 in the manufacture says it will be worth $20,000 in 3 years. You are guaranteed $20,000 for the vehicle when you bring it back. So, if in three years the car is actually worth $15,000 you don’t lose the $5000 by turning the car back in. But suppose the car is now worth $25,000 that they can now sell the car the $25,000, pocket a $5,000 return and then get another new car. Why would you want to finance that car or pay cash? Instead, let the manufacturer tell you what the car is worth today with a guaranteed value, then you can decide what you want to do after the 3 years lease is over. So, here’s why you do this: it keeps the customer asking questions and questions are always good in negotiation. Some people may just say, “No, we want to pay cash.” If they do that you just give them a cash number and sell them the car. Most people today are familiar with the idea of leasing a car and presenting a lease to them is not something completely out of the question in most cases. Whether or not they are interested in leasing, most will let you go through a lease presentation before just deciding to say yes or no one way or the other. And this is good because it keeps the process going forward and gives you the opportunity to inspire them more with your unique personality and knowledge. It also lets them know that you are thinking of ways to benefit them in any way you can when it comes to making it easier and less of an investment to get the vehicle they want. Often the idea of penciling a deal is based on a system designed to corner the customer into a place where saying No is like backing away from what they initially said they were looking for. This can come across as pressuring the customer and manipulating them with a process they have a difficult time understanding. Doing this also has a tendency to reignite their fears and suspicions about being outsmarted by a slick salesperson and being led down the path to something they will later regret. This may help you sell a car, but it will not gain you a customer for life. This is much like the ‘If I could, would you?’ approach and can feel a lot like trial closes feel to the customer and come across as negative pressure. More than anything else you want to maintain the positive perception the customer has of you that you earned during the initial sales process by being unique and different and catching them pleasantly off guard from what they expected you to be like. Never forget that ultimately your goal is to help the customer find what they are looking for and present them with the best option for getting that without basing the deal on price alone and giving away all the gross in order to get them to buy the car. By presenting various options from the first pencil on you keep them engaged in the process and this allows them to feel like they are in control of their own decision-making. Too many salespeople fear letting that happen and when they come down to the final negotiation process they handle it just like most salespeople do, rekindling in the customer the fears and apprehensions they had when they first arrived at your dealership. You don’t have to control or manipulate people to sell cars. Your first goal is to get them to like you through the process of your presentation. If they like you and they like the car, there’s a good chance that you will represent value and benefit in the mind of the customer and that price and payment will not be the deciding factor of where they buy their car and who they buy it from. In the car business, there is nothing new under the sun when it comes to techniques, gimmicks, special offers and ways to work a deal. Everything you can think of in the way of how to sell a car has been tried at one time or another. What seems to have been lost in the process is the idea of who the customer is and what they really want and deserve for their money. What also has been lost in that same process is how much value the salesperson brings to the process as well. People today are so busy just trying to keep up and, to the average person, finding a salesperson and a dealership that will focus on helping them achieve their goals as a customer is like finding real gold in a pile of costume jewelry. In short, if you treat customers with respect and dignity and go out of your way to value them as potential long-term customers and friends, they will respond in kind and listen to your advice when you give it and look to you as the expert help they need whenever they are in the market for a vehicle. If you offer a lease option in your first pencil and they don’t get it or don’t like it, don’t try to shove it down their throat because you will make more money on it. Just do a thorough job in explaining it and if they don’t go for it, move on to the next option until you find the one that works best for the customer. Be positive, inspiring and show genuine concern for their interest and most will not be as bothered about haggling for price and trying to squeeze everything they can get out of you. Stay in touch with your buyer just like you would with one who has purchased several vehicles from you at top dollar and over time they may end up being one of your best customers that cares more about the way you take care of them than just haggling for the lowest price every time they need to buy another vehicle. . . . . . . Well that does it for our program today. Thanks for joining me and And as always if you would like a complimentary copy of my books just send me an email at dlewis@davidlewis.com and I will ship them out to you immediately.